I love fantasy, and I love horror, so I think I’m gonna love The Dwarves of Demrel. 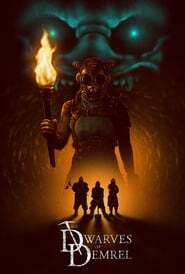 In the genre mashup, three Dwarven minors and a human overseer find themselves trapped in a mine after their tunnel collapses. Not only will they have to deal with starvation, despair, and racial tensions, but they soon learn that a monstrous creature is also trapped with them inside the mine. Two successful Kickstarter campaigns were launched for The Dwarves of Demrel. The first was for initial production funding, which ended with $52,837, and the second was for the horrific practical creature effects, which raised $19,294. And don’t worry, there’s no greenscreen here. The film was shot on location inside the Adventure Mine in Greenland, Michigan. The Dwarves of Demrel comes from director Chris Raney, who wrote the script alongside Zachary Amundson, and stars John Hutton, Brent Bateman, Robert Morgan, Serah Henesey and Gys de Villiers. The film’s official website states that it will be released on VOD on May 1, 2017, with a DVD also available to pre-order. I sure think that the world could do with more films like this.